This Fluffy Pumpkin Pie Dip delivers tons of fall flavor in a fluffy no-bake dip! Warm spices combined with a rich creamy base makes this pumpkin dip perfect for apples, bananas and more! This easy dip is the perfect pumpkin pie fix made effortless! Pumpkin Dip in is the Air! Crunchy leaves, light sweaters and crispy dewy mornings. 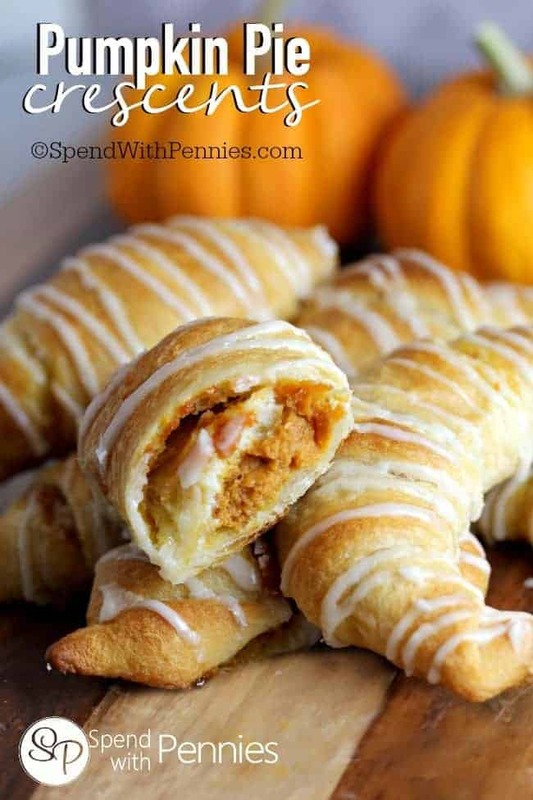 Fall is here again and that means it’s time to “pumpkin” all of the things! Pumpkin mixed with those warm cinnamon spices is just one of those things that make us think of fall! 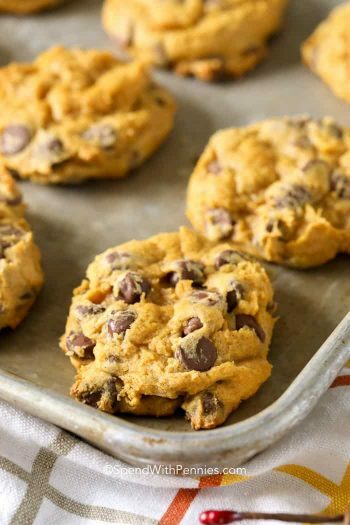 We include pumpkin in everything from quick breads, and pies to totally crazy unique cookies! Of course, I can’t forget my favorite Pumpkin Spice Lattes… the perfect fall treat! Pumpkin Pie Dip is Delish! If you’re looking for an amazing snack or dessert, this easy pumpkin dip is the answer! 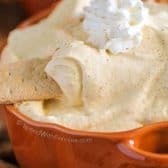 This pumpkin pie dip captures all of the fall yumminess without any of the work; in just about 5 minutes you can whip up this rich and deliciously creamy pumpkin pie dip for a fall treat anyone will love! I bring this to many events and I’m ALWAYS asked for the recipe! 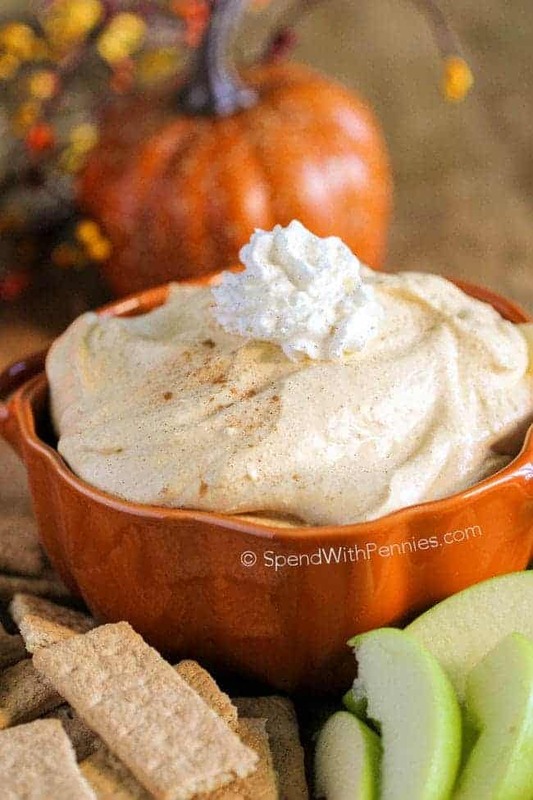 My daughter can’t get enough of this pumpkin dip and uses it as a fruit dip… it’s perfect with apples and bananas but also great with gingersnaps, graham crackers… and of course spoons. I love that it’s a dessert that makes her beg for fresh fruit! 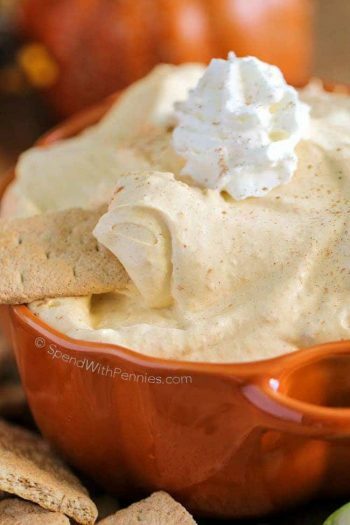 This Fluffy Pumpkin Pie Dip delivers tons of fall flavor in a fluffy no bake dip! Pumpkin & warm spices combined with a rich creamy base makes the perfect dip for apples, bananas and more! Beat cream cheese and powdered sugar until light and fluffy. Stir in pumpkin and spices. Gently fold in whipped topping. Refrigerate at least 30 minutes before serving. Serve with sliced apples, graham crackers or your favorite fruit! What is a serving size? 1/4 cup, 1/2 cup? 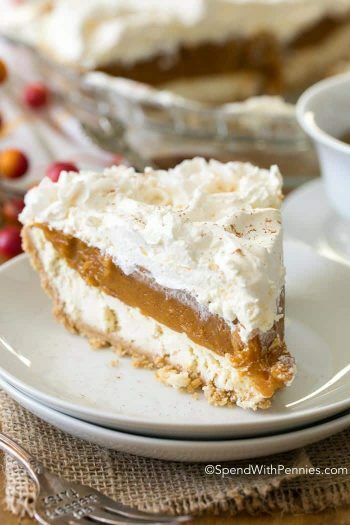 The recipe will make approximately 4 cups of Fluffy Pumpkin Pie Dip. Each serving is about 1/2 cup. This dip is amazing! I doubled the recipe for Thanksgiving. I even put it back into the cream cheese containers as presents. My family loves it! Thank you Lisa! It’s one of our favorites! Does the cream cheese need to be softened? This looks delicious! For the whipped topping, it says 2 cups.. so would that be 2 of the 8oz cool whip containers? Thanks!! 8oz of whipped topping is a weight whereas an 8oz cup is a liquid volume. You would need to measure 2 cups using a measuring cup, each 8oz tub of whipped topping is approx. 3 cups. Oh thank you for clarifying that for me!! I’ll be making it tonight. Yummy!! Love this with apple slices! How big is your serving size? I’m wondering if fresh ginger would work in a pinch? We apologize for any inconvenience! There was a glitch on the site which has now been fixed. Please let us know if you have any further trouble. Maybe you want to try Pecan Pumpkin Pie and Praline Pumpkin Pie. Hope you enjoy them! The pumpkin … 15 oz or 30 oz? The recipe calls for 1 cup of pumpkin. You would be able to get that from a 15 oz can. Wonderful! Easy! Served with cinnamon graham crackers & apple slices. This is so good!! I will make it again!! Glad you liked it Nancy! Sounds yummy! Is this gluten free? Please check the ingredients that you are adding to see if they are gluten free. I’m making this because I needed a GF dessert for Thanksgiving. All ingredients are GF but be very careful what you serve with. If someone has celiac disease, they can’t dip from the same bowl as others using cookies. Just saw your great blog!!! Thank you for those great recipes!!! Perfect for our coming fall time. 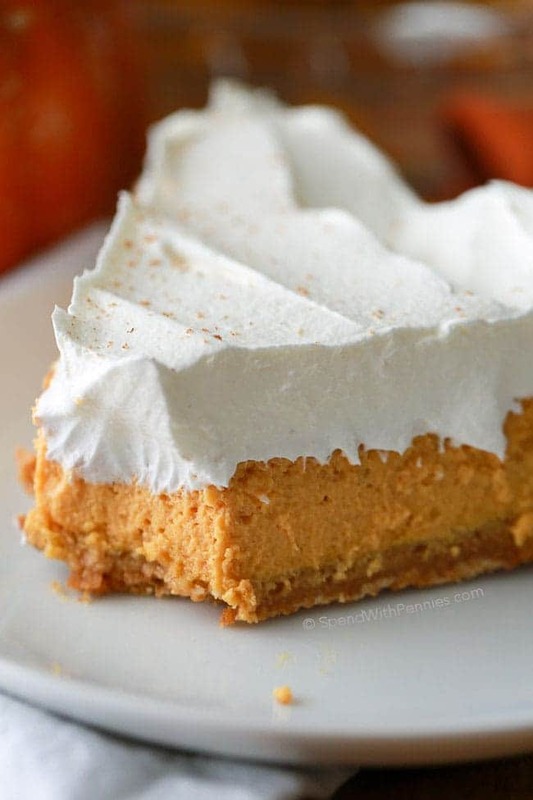 Can’t wait to make this fluffy pumpkin pie dip. It looks so delicious in those pictures!!! That was my thought when I read the recipe! I wil cut way back, possibly to a half a cup and add if it needs it. We’re big fan of spices, I always say the more the merrier. Would pumpkin spice, cinnamon, ginger and some sprinkles of nutmeg be good in this? Any of those warm spices would be perfect in this recipe. Does anyone know how long this will hold up in the refrigerator? It’s two days before Thanksgiving, but I’m trying to make as much ahead as possible. This one is good for a few days in the refrigerator. Has anyone used sweet potatoes instead of the pumpkin? I know I would leave out the ginger and pie spice, and just add cinnamon. 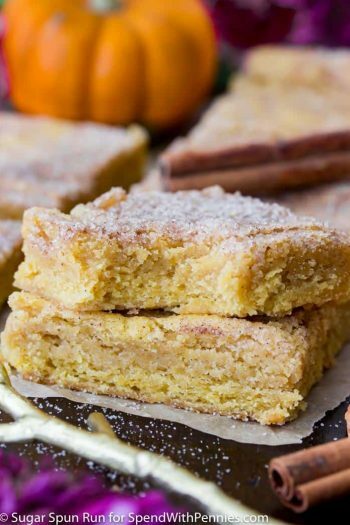 Can I use the canned Libby’s 100% Pure Pumpkin for this recipe? I screwed up a pumpkin frosting recipe by trying to use that instead of pumpkin purée. 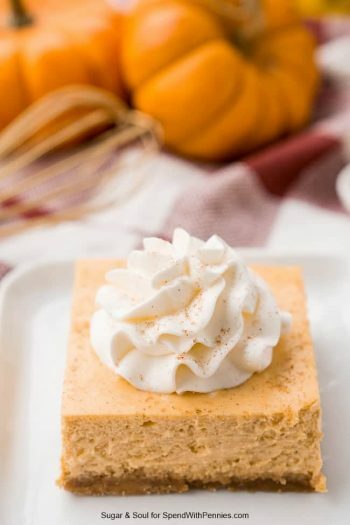 Yes, the Libby’s pure pumpkin is perfect for this recipe. What is the best way to cook Salmon where it’s not to dry ? Here is a great salmon recipe. to quadruple the recipe should I make individual recipes? and can I make tonight for Saturday noon time party? This recipe should be fine if you mix it all together in a large bowl at once. This looks so yummy,have to try it real soon. Need to get my fruit. Can I use this as a filling for cake? I think that would work perfectly! Have you ever used both pumpkin spice and cinnamon 50/50???? That would be great too! For the pumpkin pie dip, how big of a can of pumpkin do I use? The smaller can should be fine since you only need 1 cup. I’m gonna try the fluffy pumpkin dip, it sounds good. I just made this today for our potluck at work and everyone LOVED it! I was kind of wary to make it because I wasn’t sure my coworkers loved pumpkin as much as I do….boy was I wrong! By the end of the work day it was all gone. Thank you so much for this wonderful recipe, I will be making it again. I’m so glad everyone loved it Tracy! I haven’t tried freezing this so I can’t say for sure how it would work. How fluffy is the powdered sugar and cream cheese suppose to be before adding the rest ? I don’t know if I whipped it long enough before adding the pumpkin ! Just until it is fully combined. If your cream cheese was soft when you started mixing it should be fine. The whipped topping makes it nice and fluffy. Just made this! Love it and so does my kids/husband!!! What other foods would you suggest to dip other than the ones listed? Any kind of fruit or cookie is great. Bits of pound cake or marshmallows would be good too! Tastes great with preztels! You get the salty and sweet. I can’t wait to make this!!!! The whipped topping used for the dip; is it supposed to be canned whipped topping or cool whip? Well this is just wonderful. I made it for our church coffee hour this morning. Made it last night and glad I did, the flavors got even better. I can’t wait to have everyone enjoy this dip this morning. Serving it with sliced apples. Thank you!!!! I haven’t tried this recipe with Splenda. Is that just regular can pumpkin or the pie one with spices? 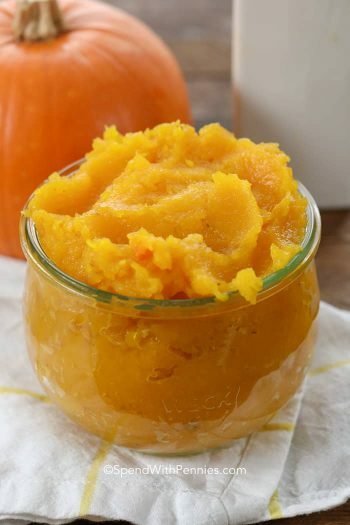 You could most likely use the pre-seasoned canned pumpkin just leave out the spices that the recipe calls for. That seems like a lot of sugar, would it be okay if it were reduced? This recipe should work just fine with reduced sugar. Can you use whipping cream for this? Yes, this can be made the day before. So good!! We dipped apples and bananas, pumpkin bread, and vanilla waffers. Just about anything could be used as a vessel to get this in your mouth!! Could eat it by the spoonfuls. Was wondering how it would be frozen?? Oh so yummy. Craving something pumpkin and happened to have all the ingredients. Was lazy and didn’t measure the whipped topping, just the whole 8 oz container. I could eat it with a spoon! Can’t wait till it sets up to actually use as a dip. Not overly sweet, but perfect pumpkin pie flavor. Thinking I might scoop into bowls and garnish with gingersnaps. Yummy! Yummy! Thanks for posting the recipe. So glad you loved it Amanda! how long can we keep it in the fridge? This should keep about 2 days in the fridge.